When I got up on Easter Sunday, Grandma Herbert was there bearing gifts but before we got to all that, I had some business to take care of. 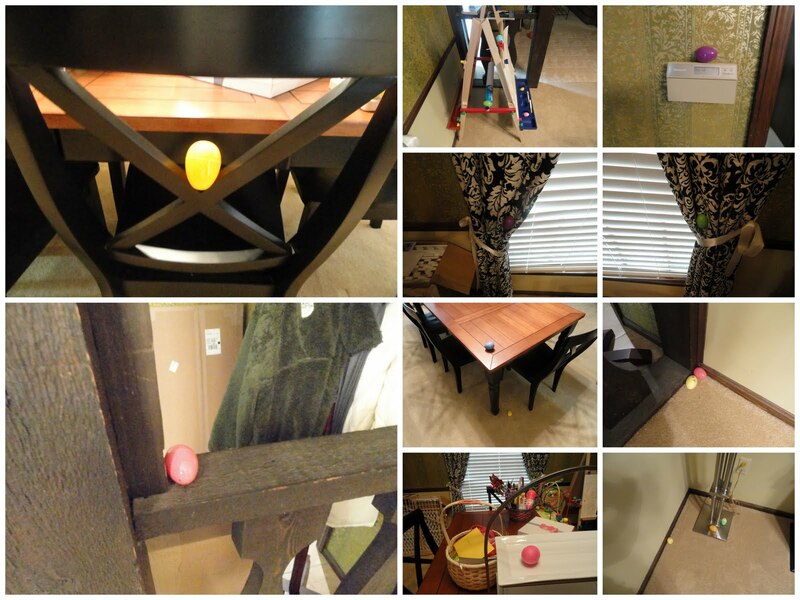 Apparently while I was asleep, a 6ft tall bunny "hid" (see above) eggs in our dining room. I guess he does it as an annoyance because Mom & Dad asked me to pick 'em all up. I mean, why do I have to clean up after this guy? Also, Parker seemed more than willing to help me out but Dad kept telling her she wasn't allowed to clean up eggs. Where's the fable? Okay, well, as it turned out the giant bunny left a preemptive thank you in the form of gift, snacks and don't tell anyone but some of the eggs were plastic AND HAD MONEY INSIDE! Sweet. After Church the four of us headed to Stroud's to meet Dad, Grandma & Grandpa Davenport, Aunt Darcy, Uncle Dave, Great Aunt Nancy, Great Uncle John, Aunt Kelly, Uncle Tim and a cadre of Zellers. Have I mentioned how awesome Easter is? Not only did a giant bunny bring me gifts and monies but G&G H, G&G D and GAN&GUJ all gave me gifts as well. SA-WEET! Stroud's is pretty fantastic but when you have a party of 18 it can be a journey. To help keep me entertained AD and GpaD took me on a few walks while the rest of the group wrapped things up. I am SO thankful when peeps recgonize that I need a little get away and take me for walks, even if I don't say so at the time. As the soializing wrapped up, Dad took a few more pics then it was back to the house to play with my new toys.